So why chose bespoke furniture when so much choice is readily available? Look carefully when you are next in a furniture shop at the then compare to the finish of the box illustrated – need we say more? 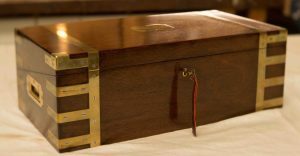 The writing slope illustrated was made for a very special person for her 21st Birthday. Her parents wanted something that she could pass to her children, who will in turn pass to their children. Very little that is purchased ready made will quite fit your awkward space that isn’t quite square! Christopher will create furniture to exactly fit the space available.